The Animal Health Diagnostic Center (AHDC) is a member laboratory of the American Association of Veterinary Laboratory Diagnosticians (AAVLD). The AAVLD has established quality assurance expectations for its member laboratories. AAVLD's Requirements for an Accredited Medical Diagnostic, Version 5.0, September 15, 2010 incorporates by reference the World Organization for Animal Health (Office International des Epizooties) (OIE) document "OIE Quality Standard and Guidelines for Veterinary Laboratories: Infectious Diseases," from the Standards Commission of the Office International des Epizooties 2008, as a guide to specific requirements for accreditation. The OIE Quality Standard origin is from the ISO/IEC 17025-1999 Quality Standard for the General requirements for the competence of testing and calibration laboratories. The AHDC obtained full accreditation in 2017 from AAVLD, renewable annually until December 31, 2022. 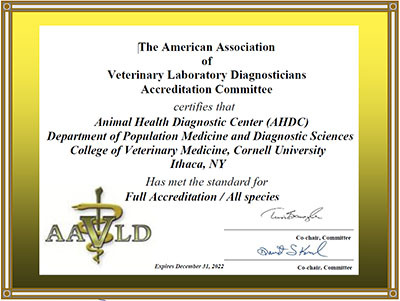 The purpose of AAVLD accreditation is to accredit public veterinary diagnostic laboratories in North America relative to technical and operational competence compatible with appropriate standards and to provide an administrative assessment. An accredited laboratory is one that is capable of providing a full range of diagnostic services year-round. The disciplines include: clinical pathology, bacteriology, mycology, virology, parasitology, serology, toxicology, necropsy, and histopathology testing services. The AHDC has been a leader in establishing guidelines that are compliant with AAVLD accreditation requirements and has generated numerous documents to comply with them. This accreditation involves the assessment of all procedures, protocols, and facilities as well as the educational status of laboratory staff, directors, professionals and technical and clerical staff. A quality assurance program in a veterinary laboratory is essential for the laboratory, veterinarians using the laboratory, and the public. It has one objective to provide confidence in the validity of the laboratory's test results and services. Veterinarians who receive timely laboratory results and are confident in their accuracy and reliability are more able to make valid medical decisions on their patients, and the public in turn will have increased satisfaction with the quality of veterinary health care. "When a large-scale animal-disease outbreak occurs, tracking its progress and performing diagnostic tests on thousands of diagnostic samples is a big challenge. To get the job done, it is very important that all the parties involved--Federal agencies and laboratories managed by State governments and universities--communicate and collaborate effectively. 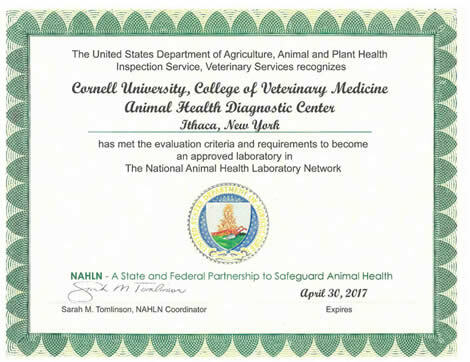 The National Animal Health Laboratory Network (NAHLN) now forms part of a nationwide strategy to coordinate the work of all organizations providing animal disease surveillance and testing services." For more information on the NAHLN, please visit their website.